Open Microsoft Internet Explorer and type in the address to configure your router, as described in your router’s instruction manual. The address and password you use will vary depending on what type of router you have, so refer to the instructions included with your router. Tip: As a quick reference, this table shows the default addresses, user names, and passwords for some common router manufacturers. If you cannot log into the router using these specs you will need to see what your default gateway is. To do this you will need to go to: start/run and type in cmd. Once the command prompt is up you will need to type in ipconfig/all. This will give you your information on your default gateway. Once you have that number you will type that into your browser window to bring up your wireless router properties. 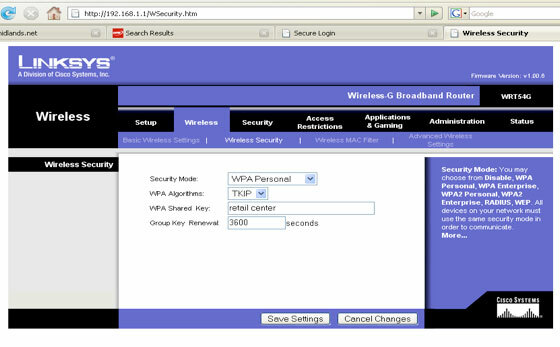 WPA is the safest way to secure your wireless router down. To get to this screen you will need to log into your router as above and then go to the wireless tab the wireless security. The first box should be WPA Personal. The next box should be TKIP. The third box will be the WPA Shared Key or password-passphrase as I call it. Put it in here and remember to write it down somewhere. The group key renewal will default at 3600 seconds. Let that one as is. The exact steps you follow will vary depending on the type of router you have. After each configuration setting (SSID, WPA and administrative password), be sure you click Save Settings, Apply, or OK to save your changes. A service set identifier, or SSID, identifies your network. Choose a unique name that you’re confident none of your neighbors will use, but don’t specify your name or your address. This is not a security tool, so you don’t need to make the SSID complex. The last configuration change you should make is to the administrative password. Just like any other password, the administrative password should not be a word you can find in the dictionary, and it should be a combination of letters, numbers, and symbols. Be sure you can remember this password, because you’ll need it if you ever have to change your router’s settings.Tip: Write down your passwords on a piece of paper and store them in your home safe if you have one. If you don’t have a home safe, store your passwords with your other important family documents. If you think of your passwords as important documents, you’ll always know where to find them. Note: If you run into problems, consult the documentation that came with your network adapter. Don’t hesitate to call the manufacturer’s technical support number for help. Windows prompts you to enter a key(this will be the shared key or passphrase that you entered earlier in the router. Type the encryption key that you wrote down earlier in both the Network key and Confirm network key boxes, and then click Connect. Windows will show its progress as it connects to your network. If the Wireless Network Connection window continues to show Acquiring Network Address, you may have mistyped the encryption key—click Cancel and return to step 3.After you’re connected, you can close the Wireless Network Connection window. Now you’re ready to browse the Web wirelessly. You can also create a wireless network in your home that connects your computers, printers, cameras, games, and other accessories for easy access and enjoyment.